The field of accounting can potentially play a role in the regular operations of business from a small-scale level up to the largest organizations in operation. Professionals that specialize in accounting are tasked with maintaining vital financial records, filing taxes, and ensuring that businesses are operating under the correct guidelines. In addition to this generalized field, there are specialty fields such as forensic accounting that provide even more utility for organizations outside of standard business. Forensic accounting is a specialty field in accounting that plays a role in the investigation of a business's financial records when fraud, litigation, or suspicion is underway. Forensic accountants can be found in many different areas, including law enforcement, law offices, private practice, and even the government. Their responsibility is to analyze financial records through traditional and online means in order to gain more information about current situations or suspicions. These professionals may also work to prevent harm within a company’s financial department by analyzing spending records, performing tax audits, or maintaining regular financial records. People that are interested in becoming forensic accountants are often educated in the field of accounting, with some professionals even holding professional certifications such as the CPA (Certified Public Assistant). However, students that are seeking a different type of career for their future are welcome to pursue degree programs such as this one, in order to meet their own potential in the field of accounting. Our team of educational experts has over a decade of experience in researching educational programs from various backgrounds. Read more in this guide to learn about this educational program and what it can possibly provide for your future. What is the Earning Potential for a Forensic Accountant? One of the most sought after answers for students that are choosing a degree program lies within the earning potential of their chosen degree program. While students should always choose a career they can enjoy, the pay is something that most people are naturally curious about. There are different factors that can contribute to how much you earn as a professional in forensic accounting, such as your experience as a professional accountant, what organization you are contracted through, and the type of investigations you provide for your organization. In order to give you more information on this specific field, our team has provided some salary information below for you to browse. Accountants and Auditors: $68,150 on average per year (BLS). Finance and Insurance Accountants: $72,950 on average per year (BLS). Accounting, Tax Preparation, Bookkeeping, and Payroll Services: $68,130 on average per year (BLS). What you can earn as a forensic accountant is important for upcoming students that want to get the most out of their professional lifestyle. However, it is also important to consider how popular your degree field is, so that you can be confident in your ability to find a meaningful career after graduation. In recent years, the field of forensics has grown incredibly large, making it one of the most popular fields for upcoming college students. In terms of statistics, students can expect around a 10% growth in this field over the next decade (BLS). This can translate to more jobs, better coverage, and increasing popularity of these degree programs. Students that are enrolling in these programs can safely assume that their degree program can continue to be sought after in organizations that desire protection from fraud. 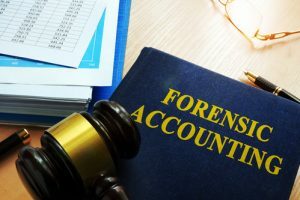 Since forensic accounting can play a large role in the criminal justice system, more knowledgeable professionals may also be needed to assist during investigations that involve businesses, individuals, and widespread analyses. The level of degree you seek to obtain can tell you a lot about what experience you can have at the college level, as well as what you can learn. Most bachelor’s level programs focus on the need for introductory information, as well as the core courses for its major. During the course of a bachelor’s experience, students may have the opportunity to blend their studies so that they receive adequate background knowledge in generalized fields such as Algebra, Psychology, and Statistics. These courses can help shape a student’s outcome in their overall bachelor’s program. At the master’s level, students can focus more heavily on their chosen major. Since all prerequisite courses are taken at the bachelor’s level, students may only take courses that are directly or indirectly related to their master’s degree. Our team of educational experts has researched both the bachelor and master level degree programs in order to highlight some differences and similarities between the two. Bachelor’s programs in Forensic Accounting were designed to introduce students to the topics that are vital for basic understanding within this field. The coursework and layout of this program can help entry-level students gain more knowledge in generalized subjects as well as specialty courses within accounting. Sample curricula for these degree programs include generalized courses such as History, Algebra, and English Composition alongside introductory courses such as Intro to Forensic Accounting and Financial Investigations. The end result of obtaining this degree can be entry-level careers in the field of forensic accounting, which can lead to greater endeavors later on down the line. Take a look below at some of the constituents of bachelor’s programs below. At the master’s level, students within this program can begin a more thorough investigation into the field of forensic accounting. Most students that move forward into the master’s program already have a bachelor’s degree in forensics or accounting, making their experience at the master’s level more thorough. Most Master’s of Forensic Accounting programs require that students obtain a relevant bachelor’s degree prior to being approved for admission. The curriculum for a Master’s in Forensic Accounting program may include courses such as Forensic Auditing, Forensic Accounting Law and Ethics, and Litigation Accounting. Read more below about what is included in these master’s programs. Before you enroll in a forensic accounting degree program, take the time to review the curriculum so that you can familiarize yourself with some of the topics that may be covered. Our team of educational experts has reviewed some popular degree programs in order to give you a better idea of what to expect after you are enrolled. The courses that are included in this program may include those that introduce you to both accounting and forensics, as well as courses that identify some of the career responsibilities of those working in the field. This course helps students understand the relationship between forensics and accounting from an investigative standpoint. Students enrolled may learn skills that are relevant to fraud examination, general accounting, auditing, and investigation. This course seeks to educate students on the laws surrounding forensic accounting. Also, students enrolled can learn about ethical behavior during the course of forensic investigations, the protection of private information, and information disclosure. Students that are enrolled in the course may learn skills that can help during the process of an internal audit. Ethics surrounding internal audits, laws, and methods may be discussed in detail. As part of this course, students may also review case studies in an effort to comprehend the challenges associated with internal audits. Cyber Forensics involves using data from computers and other information technology as evidence during a trial. Students within this course can learn how to properly analyze, collect, and present information found using technology in the court setting. This course may require previous experience in computer information courses. This course focuses on accounting that is used during legal processes. Students that learn to properly use accounting for this purpose can be a vital asset during investigations, fraud cases, and in general legal proceedings. What are the Advantages to Pursuing a Degree Online? There are many different options for pursuing a degree in forensic accounting. A lot of students still prefer the traditional route with their education, since it is familiar and reliable. However, some students are finding an even more flexible way of pursuing their degree – through online degree programs. These programs can provide students with the option of completing school work from home and scheduling around a full-time job or other responsibilities. In terms of reliability, online degree programs are subject to the same standards as traditional universities. Most online programs have the same instructors as traditional programs, allowing them to mirror the curriculum found in traditional institutions. Students that choose the online route for their degree program are not giving up quality for convenience. One of the requirements of online educational systems is to remain accredited while offering degree programs to students via the online system. When searching online programs, you can easily verify accreditation information on the school’s website. If you are one of the many busy working professionals that are looking for career advancement without drastic life changes, online degree programs in forensic accounting may be the right option for you. The dense curriculum and flexibility offered by these programs can help you learn more about what forensic accounting can provide to businesses and the legal system, as well as what your contribution could be within your own career. These programs are available at universities all over the country, just waiting for people like you to enroll. Forensic accounting degree programs can lead you in many different directions throughout your career. There are many different stages of forensic accounting that require extensive experience and expertise, many of which you can pursue after obtaining a minimum of a master’s degree. Some careers call upon professionals to assist with gathering and preparing evidence for court, examining financial statements during the initial stages of an investigation, or even providing expert insight during an actual court proceeding. Below this section, you can see the different areas you could find a career after completing your degree program. As a forensic accountant, professionals may learn that there is more to the job than just crunching numbers. Professionals within this field may be called upon during thorough investigations involving financial records within organizations, or even in personal lawsuits that involve the misuse of funds. Since this career field can be so diverse, professionals may find their career responsibilities to vary depending on where they are employed. Accountants within this domain may also be responsible for thorough investigations that involve personal interviews, risk review, and reconstruction. This career field primarily involves the investigation of financial records to identify areas of inconsistency, assisting during the creation of expert testimony, conducting audits both externally and internally, and protecting assets from threats found outside and within organizations. These topics typically involve a deep dive into the purchases, sales, and financial records of organizations or individuals in order to gather the information requested. This career field may require that individuals have strong skills in computer information technology and accounting. In addition to these standard skills, students that graduate from this degree program may also need to have knowledge that is relevant to criminal investigations. In order to properly gather, analyze, and present findings, professionals must know the proper methods for doing so. These skills can help keep investigations legal and protect the rights of everyone involved. Forensic accounting is a fascinating field that can potentially contribute a lot during the course of forensic investigations. Students that have a knack for accounting, but want diverse career opportunities may find that this is an excellent place to get a start. When pursuing a career in this field, professionals are encouraged to display complex problem solving skills, a highly investigative nature, and experience in the field of accounting.